HE is 84 and the religious head of lakhs of Namdharis all over the world, including India. Besides being a spiritual leader, Satguru Jagjit Singh has given birth to a parallel religion — the religion of music. In the history of music, he will always be credited with unmatched passion that sowed the seeds of a silent musical revolution in Punjab, which of late has had little to boast of in the field of classical music. Although age is catching up with him yet his thirst for music remains insatiated. It was as early as 1959 that Satguru Jagjit Singh had foreseen the dearth of talent in the field of classical music in Punjab. He was taken aback to learn that only two ragis, Darshan Singh and Khazan Singh, were using Indian classical vocal forms while reciting Gurbani. What will happen in the future, he asked himself. "People of Punjab had not realised that this fine art was being eroded in the state. I desperately wanted classical music to thrive in the state," reminiscences the Satguru. Balwant Singh Namdhari (extreme right) was decorated with the Punjab State Award this year. Beyond the fast-paced lifestyle of the Punjabis and unnoticed by the powers that be, in a remote village called Bhaini Sahib, known as the seat of the Namdhari sect, the foundation of Indian classical vocal/instrumental music was being laid. 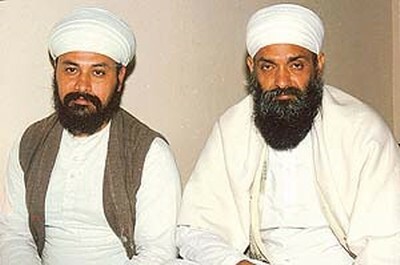 Though it takes a long time for any such serious forms of music to gain recognition, Bhaini Sahib saw the rise of Mohan Singh Namdhari and Sukhdev Singh Namdhari, who have carved a niche for themselves in the world of music. They have performed not only at Haraballabh, held annually in Jalandhar, but also at various other functions in other parts of the country and even abroad. That Satguru Jagjit Singh did not restrict his teachings to his followers alone but imparted his knowledge of music to others too speaks volumes for his dedication and zeal. Once in Gwalior, when he heard budding Indian classical vocalists Rajan and Sajjan Mishra, he immediately took them under his wing. When he learnt that the two brothers were earning their living as petty clerks, he immediately offered to pay them double the amount they were earning from Namdharis’ offerings. He wanted them to devote themselves totally to riyaz without worrying about their bread and butter. Today, the Mishra brothers are the pride of India and they do not get tired of acknowledging the role played by Satguru Jagjit Singh in promoting their career. Once again, led by his farsightedness, he consciously decided to revive many dying musical instruments of Punjab. 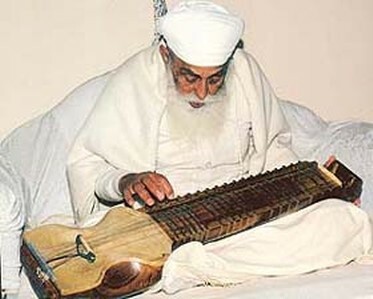 As a result of his efforts, rabab, dilruba, saranda, sarangi, santoor and sitar have been popularised by his disciples, who play them oblivious of any consumerist or materialistic pressures. Hundred of children in the age group of 8 and 15 years are today learning to play these instruments and are also being trained in classical vocal. A stream of students, including Mohan Singh and Sukhdev Singh, have been making waves at various musical performances in India and abroad. Two young boys, Balwant Singh Namdhari and Harjinder Singh Namdhari, are being taken note of music circles in India. Balwant is not only being acknowledged as one of the most promising players of santoor, sitar and tabla but is also a name to be reckoned with as a classical vocalist. On this February 27, he was decorated with the Punjab State Award for Indian Classical Vocal and Santoor Vadan at a state-level function in Kapurthala by the Punjab Chief Minister, Capt. Amarinder Singh. Harjinder Singh has won a name for himself as a noteworthy rabab player. The sparkle in the eyes of Satguru Jagjit Singh cannot be missed as he hears his disciple Harjinder Singh, the only other player of rabab besides himself, weaving a raga on this majestic instrument. Harjinder Singh has already adopted two young Namdhari children to train them to play this instrument. Interestingly, Harjinder is also equally comfortable with the bansuri, dilruba and sarod. It may be mentioned here that in 1930, Bhai Taba, the last rababi of that era, was forsaken by his employers. Likewise, Bhai Naseer, the pakhawaj player of the time, found no patrons. It was at this juncture, when both these artists were finding no patronage, that they were adopted by Guru Partap Singh of the Namdharis. The duo thus became the hazoori musicians of the guru. 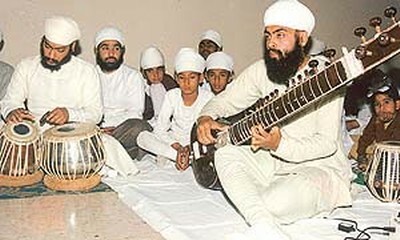 Satguru Jagjit Singh has ensured that all students at Bhaini Sahib should learn both vocal as well as instrumental music. So while you have Devinder Singh who not only excels at playing the dilruba but also sings classical numbers, there are others like Satwant Singh, Jagjit Singh and Harpreet Singh who are enthusiastically learning the finer nuances of music under the guru-shishiya parampara. Satguru Jagjit Singh’s name, as a renowned musician, would also be remembered for having evolved new maatras like paune aath (seven and three-fourths), paune pandhran (fourteen and three-fourths), sava chaudhan (fourteen and one-fourth), saade staran (seventeen and a half) and teran sahi satt bata aath (thirteen and seven-eights). Though lakhs of Namdharis all over the world and within India revere and look up to Satguru Jagjit Singh, this humble religious head, in turn, has a lot of respect for his musicians. The musicians who perform sit on a higher platform than the seat reserved for the guru of Namdharis.